Many people don’t know about the old fashioned beauty aid, castor oil. It is an nexcellent product to use for generating hair growth on thinning eyebrows and lashes and to help you maintain a full head of hair. Additionally, it is inexpensive and 100% natural. The one drawback of castor oil is that it is very sticky and thick, so using it takes a certain technique. This may explain why it is not as popular as it should be. In this article we will discuss ways you can use castor oil on eyebrows, your eyelashes, your hair, skin and lips. Read on to learn more. Many women have found that castor oil is excellent for regrowing overly plucked eyebrows. It is not an instant fix because it can take several months to really take effect. The key is to get a good quality, natural, cold pressed castor oil and use it consistently. You should apply it to your eyebrows every night after cleansing your face. You should notice that your eyebrows are growing in thicker and darker in approximately three months. When using castor oil for eyebrows growth, remember to also give your eyelashes a treat. Apply it very lightly and carefully to avoid getting it in your eyes or clogging your tear glands (which could cause conjunctivitis). A light, nightly application of castor oil will result in longer, thicker, stronger eyelashes. It will also help prevent breakage, shedding and thinning. Castor oil works to generate hair and prevent hair loss because it is high in omega 9 fatty acids and ricinoleic acid. Omega 9 fatty acids nourish the skin, hair follicle and the hair itself. Ricinoleic acid fights both fungal infections and bacteria, so it helps keep your skin and hair follicles healthy and addresses many problems that inhibit the growth of hair. Castor oil is thick and rich, so it provides hair with a protective coating. It also penetrates the skin and hair shaft very deeply to nourish completely. In addition to using castor oil on eyebrows and eyelashes, you can get good results by applying it to the hair on your head. For high gloss and nourishment, use a small amount as a hair dressing. Understand that it really does not take much castor oil to make a big difference. Just two or three drops will give your hair noticeable shine. More than that will result in greasiness. It is best to apply it to the hair ends when using it in this manner. It will smooth frizzy hair and impart a natural shine. There are two ways you can use castor oil to treat thinning hair. If your hair is thinning around the hairline, apply it full strength, lightly and directly at the hairline. If you are experiencing overall thinning or patchy thinning throughout the scalp, you will want to blend castor oil with a lighter carrier oil for easy application. Some good choices are apricot kernel oil or melted coconut oil. 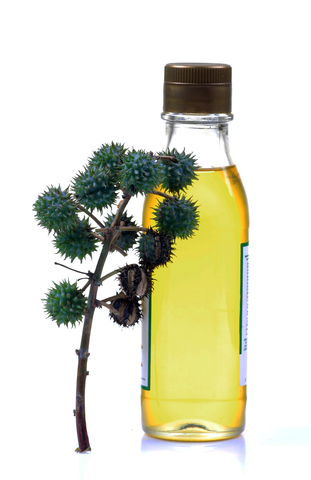 Castor oil is an excellent skin softener and can be used blended with a carrier oil for overall skin softening. It can also be used full strength on scars to help reduce even very stubborn scars. It works because castor oil stimulates white blood cell activity and acts as an anti-inflammatory agent to promote quick healing of wounds and to reduce and prevent scar formation. As a lip gloss, castor oil is superior to all other products. It provides deep nourishment and strong, natural protection from the ravages of the environment. Because of its thick, sticky consistency, it stays put once you apply it. It also looks nice, imparting an attractive shine to the lips. Why not simplify your beauty kit by doing it all with one product? Castor oil for eyebrows, lashes, hair, skin and lips is an all natural product that produces excellent beauty results.